It’s maple syruping time in the northern states. The combination of cold nights followed by warmer days allows for the most generous sap flow in the sugar maples, and the syrup makers head to the woods to collect it by the bucketful, then boil it down into the deep amber-colored ambrosia we know as maple syrup. The perfect flow conditions are only present for a few weeks, so other tasks get moved to the back burner as the syruping moves to the fore. That’s generally how it goes with “flow,” right? Our flowing might relate to our work or our play, our solitude or our being together, our art or our writing. Whatever it is that invites us into the flow, when we are in it, we know! We let go of extraneous distractions and allow ourselves to be carried along a glorious lemniscate of breathing deeply and creating freely. The ever-present phone lays abandoned and we feel intoxicatingly alive in the rhythm of life. In what ways can you embrace the rhythm of life this week and surrender yourself to the flow? “This being March in Maine, we have tapped several maple trees in our play area by the edge of the woods. 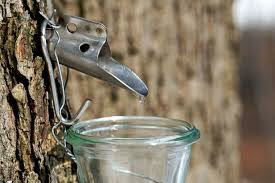 This year we tapped more trees than usual, and the sap is flowing well! We will be checking all the buckets daily, pouring the sap through a cheesecloth filter and then boiling down the sap into sweet maple syrup. After giving thanks to the maple trees, the children helped to drill holes and hammer in the taps, six trees in all. 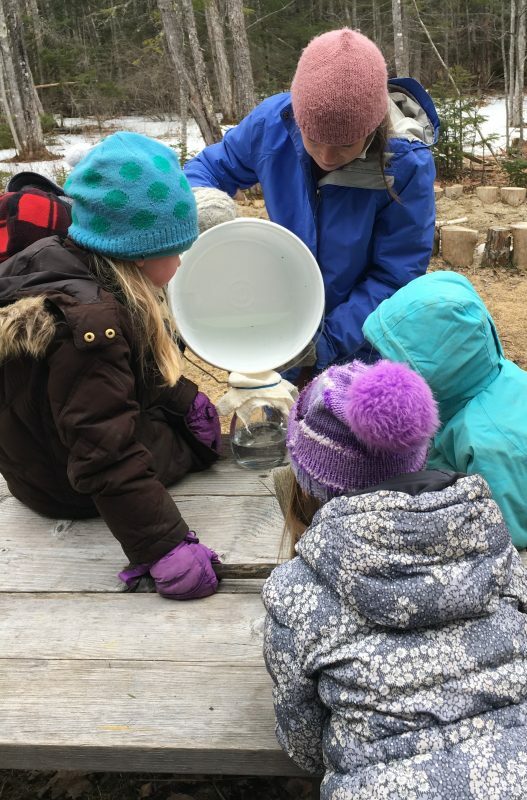 Each child waited eagerly, yet patiently, for their turn to catch two drops of sap on their tongue before we hung the buckets (plastic gallon water jugs). Every morning last week the children looked out the window to check on how full the buckets were becoming. The children helped to empty the buckets, strain the sap through cheesecloth and pour it into a pot. We have boiled down two gallons of sap so far, and have a cup of precious syrup to show for it. 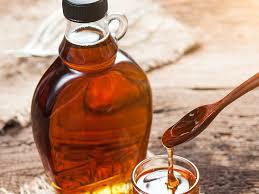 We will be offering children maple syrup to enjoy on bread this coming week. 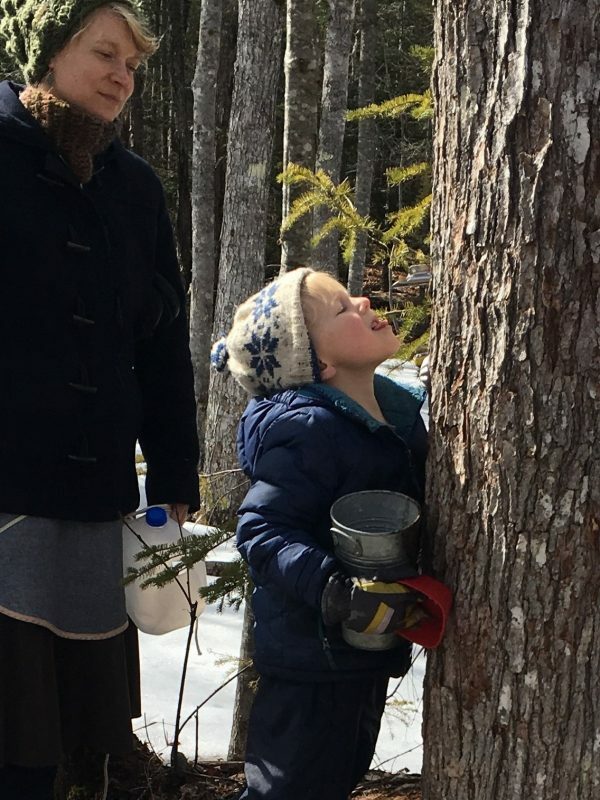 In March, as the sap rises in the trees, we also sense a stirring in the children…a heightened energy. It is something we notice like clockwork each year at this time. Every March we make the decision to adjust our schedule to spend more time outdoors. This year, we have decided that one of us will bring a few children outside to check the buckets during playtime, between 9-9:30 am, while the other stays inside with the remaining children. The outdoors is such an amazing tonic for late winter/ early spring fever! Splish, splash ! Drip, drop ! 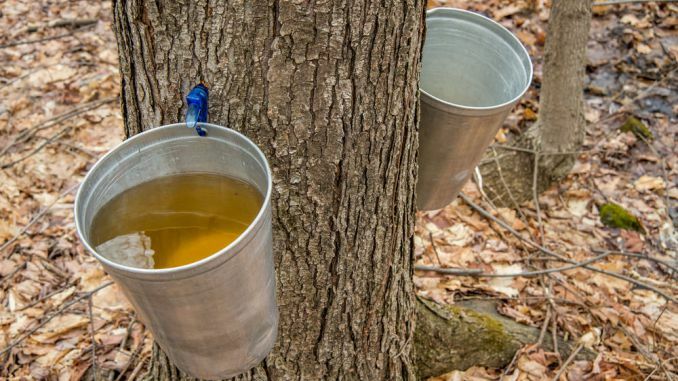 Maple sap flows into the pot ! Thanks to Pamela Perkins for this delightful “teeny tiny poem” to work into a circle time or story. 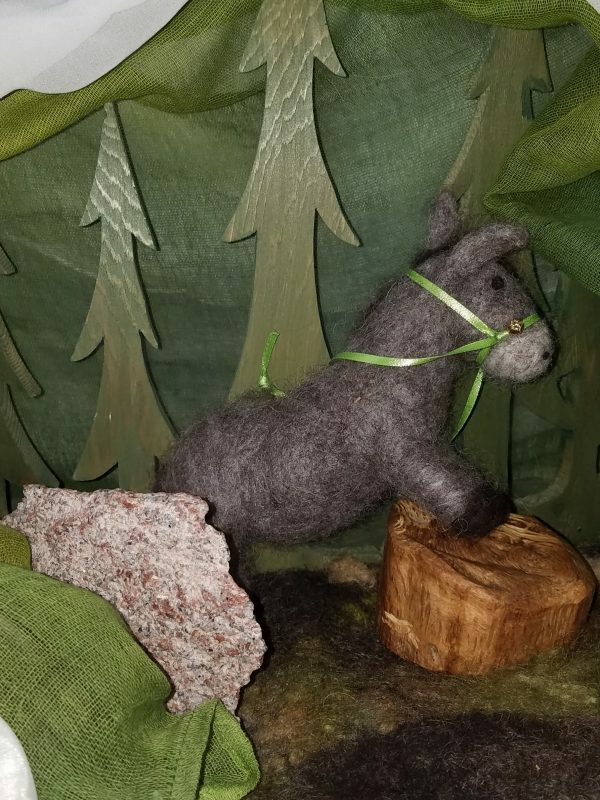 Our colleague, Suzanne Down from Juniper Tree Puppets offered a challenge on Facebook recently for people to write and share two-line poems suitable for children. This is a wonderful way to get into the flow of writing stories from the heart. A lovely little story can emerge from just two simple lines. Go ahead and give it a try! Share yours in the comments below. It was a chilly but sunny April day – April the first, as a matter of fact. The chickadees sang gaily as they flitted about their early springtime tasks. Daphne listened to their twittering and chirping and sighed. She was so very tired of being in the barn. She was bored. After a while, she thought that she heard someone call her name. Maybe it was her friend Chirpy Chickadee. Chirpy lived in a large, thickly tangled bush next to the barn. Yes, yes, now Daphne was sure of it. She leaned against the door of her stall to hear more clearly. Daphne, like many other little donkeys, had a stubborn streak. She also had a good sprinkling of temper that sometimes got the best of her common sense. So even though she had had no particular intention of breaking out of her stall and the barn, she was now determined to do so. Frederick clucked his tongue at her and let out a long sighing neigh. The hens, flustered by the sudden noise, squawked and flapped all over the barn. Violet rolled her big brown eyes anxiously and Pumpkin blatted. Daphne paid them no heed. She trotted over to the big barn doors. They were slightly ajar. She pushed with her nose. She turned around and shoved with her backside, then kicked with her heels. The door creaked open. Daphne peeked out. She looked to the left. She looked to the right. No one was outside. At first, Daphne was content to stand in the barnyard and enjoy the lovely warm sunshine. Then she sniffed and stretched out her neck. She smelled … Green! There were tiny patches of tender new growth just outside of the corral. Trotting over to the fence, Daphne tried to reach through the fence to nibble; those delicious looking leaves and shoots were just out of reach. Daphne was suddenly very, very hungry. She wanted to be on the other side of the fence. She had an idea. Daphne casually pushed against the boards here and there, hoping to find a weak place. Sure enough, one post by the maple tree was slightly rotten and wiggly. She pushed. She shoved. She prodded. She poked. Suddenly the wood gave way with a ‘carrack!’ Daphne quickly glanced all around her … the coast was clear. Through the fence she went and out into the wide world. She jumped for joy, kicking up her heels. She twisted and turned. She rolled in the thick, rich-smelling mud. She delicately nibbled the first thin blades of green grass and flat rosettes of dandelion leaves and tasty wild plantain that had sprung up where the snow and ice had melted off. Mmmmm! Delicious! On and on she went, munching here and there, feeling free and excited to be on an adventure. When she reached the edge of East Meadow, she saw that the ice was almost completely gone from the Farm Pond. All around the edges, the clear water lapped gently in the breeze. She took a nice, long drink of cool, fresh water. Looking up and around her, she thought that perhaps she should go back to the barn now; she was tired from her running and leaping, and her tummy was full. Daphne looked towards the forest, then back towards the barn. Impulsively, she decided what she would do next. We recently served this delicious creamy baked oatmeal at a Living Arts workshop in Milwaukee, WI and people lined up to write down the recipe! 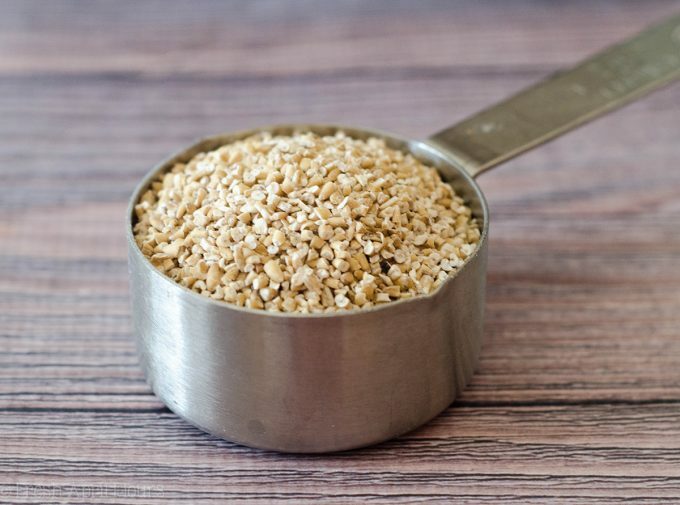 Combine oats, yogurt or buttermilk and 3 cups water and soak, covered, at room temperature overnight. At least one hour before serving, in a large pot bring 3 cups of water or milk to a boil and add a pinch of salt. Add soaked oats, along with their soaking liquid (the oats will have absorbed most of their liquid). Cook and stir often on medium heat for about 10 minutes. Add butter and combine. Separately, in a medium bowl, whisk together eggs, maple syrup, and heavy cream and then add to oatmeal mixture in pot. Optional to add: 1/3 cup dried fruit, ground cinnamon to taste, 1/3 cup chopped nuts, or 1 ripe banana, mashed. Pout into baking dish and bake on the middle rack of oven for 45 minutes. 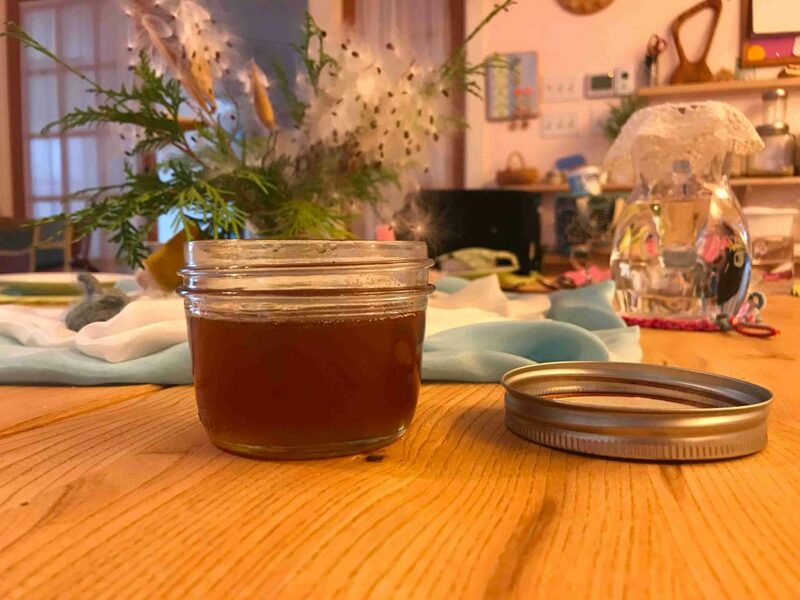 This is a recipe from Rosebud Garden, a LifeWays Representative Program at Kimberton Waldorf School. Farmhouse Manna serves as both a cookbook and guide to help reconnect you to home rhythms, mealtime rituals and wholesome food for a more nourishing lifestyle. From the very first page, you will begin a journey to cultivate more manna in your kitchen, your home and your life. This vibrant cookbook includes over 50 recipes and rituals for head, heart, hands and soul. From snacks and lunch to evening gatherings, aims to inspire new ways for you to use your seasonal, local and organically grown foods. The hardcover edition (special price for LifeWays’ audience of $39) is available for purchase at Farmhouse Manna. Really, just check out this website because it is beautiful and there are more delicious recipes there. 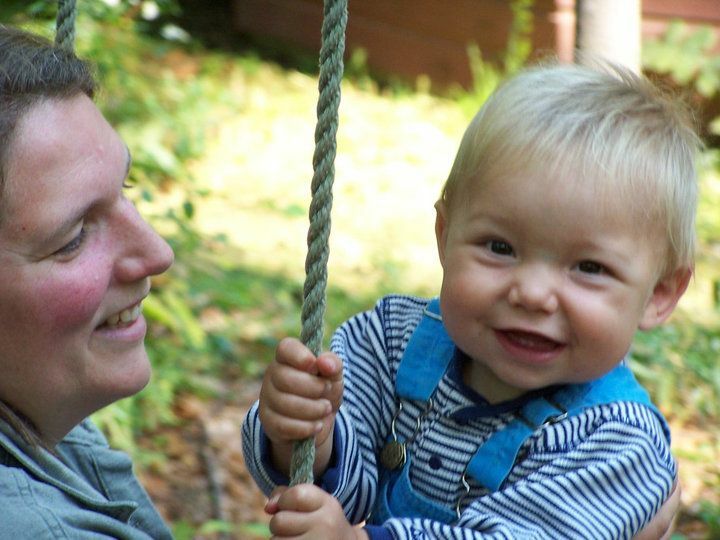 from Kerry Ingram, a mom, foster mom, LifeWays grad, board member and Waldorf trained teacher. She is the founder of Mothering Arts which supports women with all the tools and inspiration they need to create a local postpartum nurturing group. You can find her enjoying the magic of nature with her family and community in northern California. Keep the day and your body flowing with ease by hydrating. Water is life, our body needs clean water to thrive and be sure all of our systems are running smoothly; this includes our nervous system and our emotions. To keep me and my family flowing through our day, I like to fill a large glass pitcher with water and a few flowers, herbs or fruit slices and keep it on my counter top where I see it all day. Not only does it look lovely and inviting, it also gives me at-a-glance feedback of how much (or little) water I have had. I strive to finish the pitcher by dinner and then have two more glasses before bed. You can also carry a large hydro flask or mason jar with you while you are at work or out and about to keep hydrated and flowing in your day. 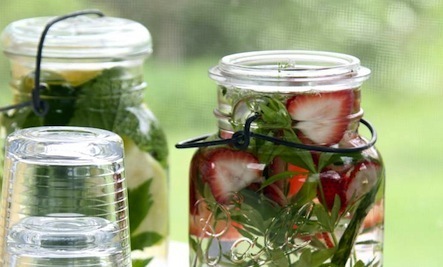 A few favorite herbal water combinations are: cucumber and mint, lemon and rosemary, cleavers and a slice of grapefruit or lemon verbena lemon balm. Join us for the Living Arts workshop in Westport, CT April 13th and 14th, and learn more about bringing the goodness of the Living Arts into your home or program! The setting is a beautiful old school that is now a private home, and there is lots of room for people to stay on site. Won’t you join us? Click here for more information about the workshop. Winters come with ice and snow, while bulbs and seeds sleep deep below. Soon warm sun and gentle rains will bring the springtime back again !